Residents of the Gaza Belt attempted to block a shipment of goods into the Gaza Strip on Sunday morning in protest against Israel continuing to provide medicine and supplies to the Strip despite the security situation. 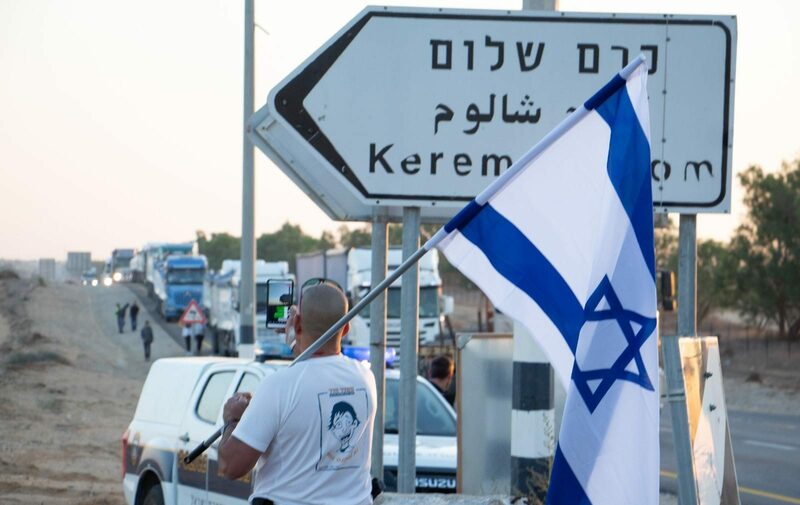 The protestors also included members of ‘Misdar Hadar’ – a group comprised of friends and family of fallen IDF officer Lt. Hadar Goldin, who was killed in the Gaza Strip in the summer of 2014 during Operation Protective Edge, and whose remains have been held by Hamas since. After about an hour of protests, Police evicted the protesters from the route, with no arrests. “From this difficult meeting, we concluded that the prime minister does not want to bring back the soldiers to Israel,” the Goldins said. Shortly after the Goldin’s assertion, the IDF Spokesperson’s Unit put out a statement claiming that Eisenkot’s words were taken out of context, and that they only embody a partial representation of what was said in the meeting. In an interview to Army Radio on Sunday morning, Simcha Goldin repeated his claim that Netanyahu does not hold the returning of the soldiers as a high priority. “Netanyahu puts us at the bottom of the list in the ceasefire negotiations with Hamas,” said Goldin, “Why should the Egyptian [mediators] take care of the issue of my son? Is he an Egyptian soldier?” he added.